Nonclassical light sources of single and entangled photons are the backbone of future quantum communications infrastructure, and the cornerstone for realizing optical quantum computers. To reach practical applications, however, the enormous technical complexity of today’s sources must be drastically reduced through the development of integrated devices. Recent years have seen significant progress in realizing compact sources of nonclassical light and functional waveguide circuits based on integrated photonics, although limited to the emission of just two photons. 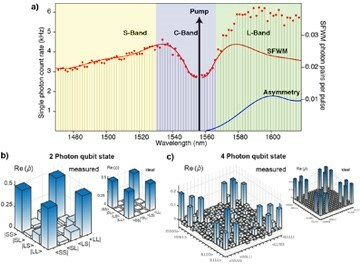 In a recent work, Prof. Morandotti’s group presented an approach for generating multiple two-photon and multiphoton entangled quantum states within a single waveguide mode. Using integrated optical frequency combs operating well below the optical parametric oscillation threshold, photons are generated on many frequency modes simultaneously through spontaneous four-wave mixing. The generation of over 100 frequency modes spanning the full S, C, and L telecommunications bands has already been demonstrated.